Ultrasonic flow meters are non-intrusive devices that use acoustic vibrations to measure the flow rate of liquid. There are two types, Doppler and transit time. The Doppler and transit time flow meters operate on a similar principle, but the technology varies significantly, so it’s important to know which flow meter to use for your application. An ultrasonic flow meter (non-intrusive Doppler flow meter) is a volumetric flow meter which requires particulates or bubbles in the flow. Ultrasonic flow meters are ideal for wastewater applications or any dirty liquid which is conductive or water based. 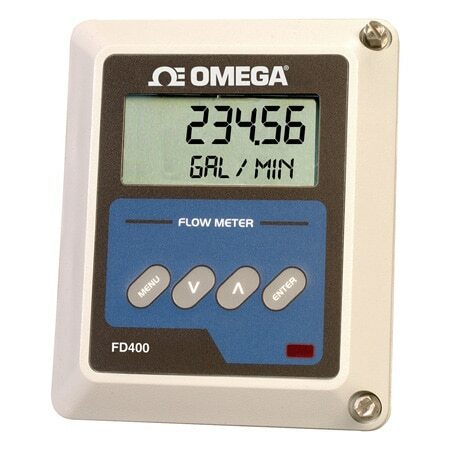 Ultrasonic flow meters will generally not work with distilled water or drinking water. Aerations would be required in the clean liquid applications. Ultrasonic flow meters are also ideal for applications where low pressure drop, chemical compatibility, and low maintenance are required.  How does an ultrasonic flow meter work? Ultrasonic flow meters are a non-contact means of measuring flow velocity. They are clamp-on devices that attach to the exterior of the pipe and enable measurement of corrosive liquids without damage to sensors. The two types of ultrasonic flow meters, Doppler and transit time, each function by way of two different technologies. The Doppler ultrasonic flow meter must have particles or bubbles to reflect the ultrasonic signals. Consideration must be given to the lower limits for concentrations and sizes of solids or bubbles, and the liquid must flow at a rate high enough to keep the solids suspended. However, transit time ultrasonic flow meters compare the difference in time from when an ultrasonic signal is emitted from one transducer to the next. Therefore, the liquid cannot contain a significant amount of solids or bubbles or the high-frequency sound will be abated and too weak to travel across the pipe. The basic principle of operation employs the frequency shift (Doppler Effect) of an ultrasonic signal when it is reflected by suspended particles or gas bubbles (discontinuities) in motion. This metering technique utilizes the physical phenomenon of a sound wave that changes frequency when it is reflected by moving discontinuities in a flowing liquid. Ultrasonic sound is transmitted into a pipe with flowing liquids, and the discontinuities reflect the ultrasonic wave with a slightly different frequency that is directly proportional to the rate of flow of the liquid. Current technology requires that the liquid contain at least 100 parts per million (PPM) of 100 micron or larger suspended particles or bubbles. The Doppler ultrasonic flow meter operates on the principle of the Doppler Effect, which is the physical phenomenon of a sound wave changing frequency. In the case of ultrasonic flow meters, the frequency of an ultrasonic signal changes (Doppler Effect) in direct proportion to the rate of flow of the liquid when reflected by suspended particles or gas bubbles (discontinuities) in motion. Transit time ultrasonic flow meters measure the time difference between when an ultrasonic signal is transmitted from the first transducer until it is received by the second transducer. 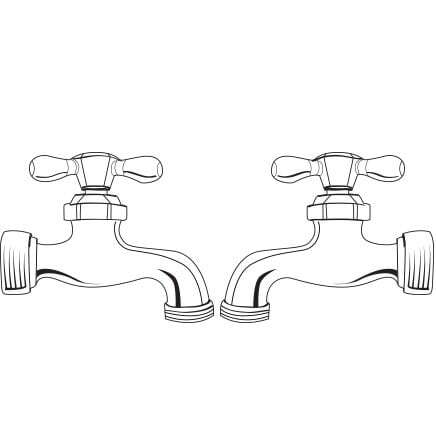 A comparison is made of upstream and downstream measurements. If there is no flow, the travel time will be the same in both directions. When flow is present, sound moves faster if traveling in the same direction and slower if moving against it. How do you select the right magnetic flow meter? Ultrasonic flow meters are also ideal for applications where low-pressure drop is needed, and low maintenance is required. An ultrasonic Doppler flow meter is a volumetric flow meter that is ideal for aerated liquids such as wastewater or slurries. Transit time ultrasonic flow meters are ideal for clean liquid applications such as water and oil. There are three main types of ultrasonic flow meters. Factors such as the type of output (analog or digital), size of the pipe, minimum and maximum process temperature, pressure, and flow rate can all impact which ultrasonic flow meter is right for your application. Ultrasonic flow meter with totalization:These ultrasonic flow meters are well-suited for full pipes of liquid that contain at least 100 ppm of 100 microns or larger suspended particles or gas bubbles for pipe sizes 0.25 to 120”. Ideal uses include flow measurement of wastewater sewage, reactivated sludge, waste activated sludge, primary sludge, slurries, crude oils, lime slurries, phosphates, and pulp stock. 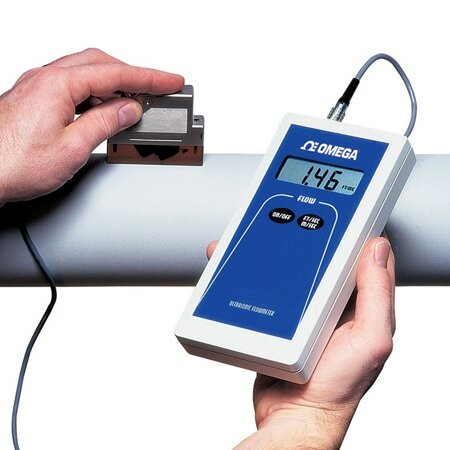 Portable ultrasonic flow meter:This ultrasonic flow meter uses a non-invasive clamp-on transducer, which is placed on the outside of a metal or plastic pipe containing liquids with more than 100 ppm of 100 microns or larger suspended solids or entrained gases. Hybrid ultrasonic flow meter:This ultrasonic meter allows you to measure the flow rate of liquids with particulate or bubbles by selecting Doppler technology or clean liquids by selecting transit time technology. Clamp-on ultrasonic flow meters come in either single or dual-sensor versions. In the single-sensor version, the transmit and receive crystals are potted into the same sensor body, which is clamped onto a single point of the pipe surface. A coupling compound is used to ultrasonically connect the sensor to the pipe. In the dual sensor version, the transmit crystal is in one sensor body, while the receive crystal is in another. Clamp-on Doppler flow meters are subject to interference from the pipe wall itself, as well as from any air space between the sensor and the wall. If the pipe wall is made of stainless steel, it might conduct the transmit signal far enough so that the returning echo will be shifted enough to interfere with the reading. There are also built-in acoustic discontinuities in copper, concrete-lined, plastic-lined, and fiberglass-reinforced pipes. These are significant enough to either completely scatter the transmitted signal or attenuate the return signal. This dramatically decreases flow meter accuracy (to within only ±20%), and, in most cases, clamp-on meters will not work at all if the pipe is lined. Both Doppler and transit time flow meters are designed to clamp onto the outside of a pipe without breaking the line or interrupting the flow. This also eliminates pressure losses and prevents leaking, which is common with an inline flow meter. The accuracy of an ultrasonic flow meter relies on proper mounting. Large temperature changes in the pipe or a significant amount of vibration may affect the alignment of the transducers and acoustic coupling to the pipe. In most cases, ultrasonic flow meters won’t work at all if the pipe is lined with materials such as copper, concrete, plastic or fiberglass. These factors must be accounted for during installation. In addition, to provide an accurate volumetric flow rate, all ultrasonic flow meters require the pipe to be full. 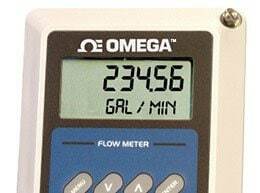 Learn more about flow meters in this article. 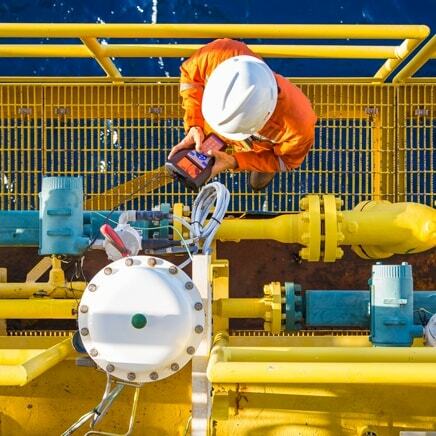 Ultrasonic flow meters are mostly used in oil and gas industries. They are also used in chemical, pharmaceutical, food and beverage, metal, mining, pulp and paper and wastewater industries. These ultrasonic flow meters are for applications with 100 PPM of 100 microns in size particulates or bubbles in the liquid. They are good for pipe sizes 0.25 to 120". These flow meters are used for flow measurement applications of 0.1 to 30 FPS. 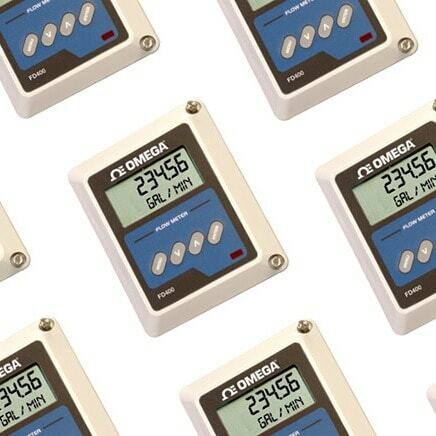 The FD-400 series has an optional display, and 4 to 20 mA output, Relays and 12 V pulse output options. The FD-400 Series ultrasonic flow meter transmitter systems are designed for use where a sensor cannot be installed in the process. For liquids with suspended solids or aeration, standard and enhanced models. Available in non-invasive fixed position style. The FD-400 is an ideal doppler flow measurement solution. They are well suited for full pipes of liquid that contain at least 100 ppm of 100 micron or larger suspended particles or gas bubbles which act as sound "reflectors" and are necessary for operation. Ideal uses for this technology include: flow measurement of wastewater sewage, reactivated sludge, waste activated sludge, primary sludge, slurries, crude oils, lime slurries, phosphates and pulp stock.